Christ commanded us to go into all the world and preach the gospel to everyone. But how well have we fulfilled this Great Commission? How can we bring the gospel to the rest of the world? 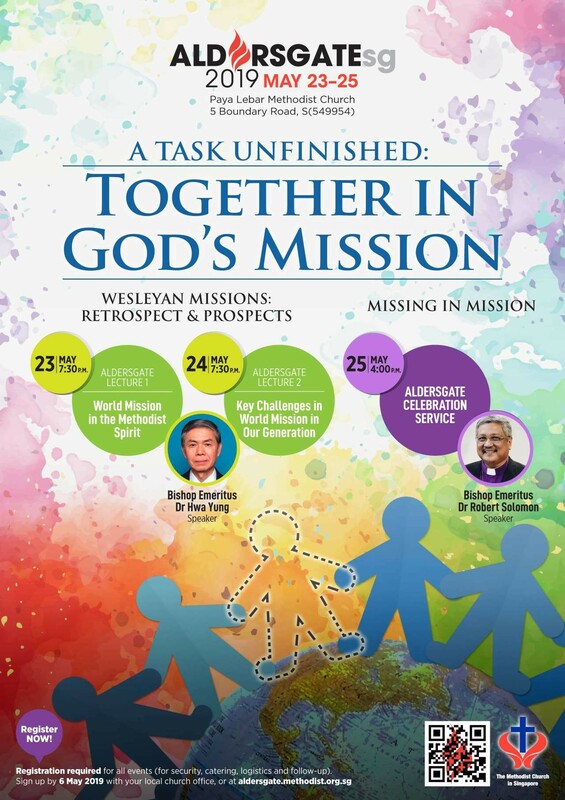 Aldersgate SG 2019 takes a look at the retrospect and prospects of world mission in the Methodist spirit, and the who and what is missing in mission. Come and join us at Aldersgate SG 2019! Synopsis: A look in retrospect at what John Wesley’s statement “The world is my parish” means and implies; his vision and the other leaders like Asbury for planting the church in UK, America and eventually the rest of the world; the commitment and sacrifice this vision entailed; and what these mean for us today. Synopsis: A prospective look at some of the challenges faced by global Christianity, such as the increasing weakness of the western church and the declining numbers of missionaries sent out. In contrast with the growing missionary numbers from the Majority World, the geopolitical implications of an increasingly multi-polar world, the growing persecutions of Christians all over the world and the increasing demand for the gospel to demonstrate its relevance in the world of today—how do we prepare the church for effective mission in face of these? Register now @ aldersgate.methodist.org.sg. Closing date for registration is on 6 May 2019. For enquiries and more information, please visit aldersgate.methodist.org.sg, view this video, email communications@methodist.org.sg or call +65 64784765. Aldersgate SG is the yearly keynote event of The Methodist Church in Singapore. It is organised annually by The Methodist Church in Singapore to commemorate Methodism’s founder John Wesley’s Aldersgate experience on 24 May 1738. This annual series of events brings together the Methodist family to celebrate the values of compassion and discipline in our rich Wesleyan heritage and be inspired anew to serve God through social action, evangelism and discipleship.